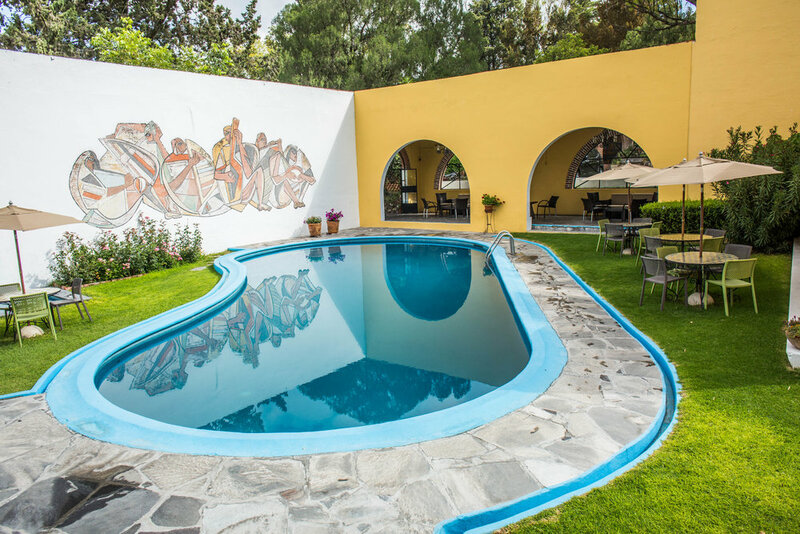 When you are at El Atascadero, it's easy to feel like you're in a serene colonial world all to yourself. Our lush natural gardens are designed to make your stay feel exclusive and relaxing. The hotel grounds are a sanctuary of timeless indulgence in nature, full of places to discover, relax and make lifetime memories. Our heated resort pool is large enough for laps and includes a connected hot tub just a few steps away. The front desk and room service are available day until 10:30pm, so you can get everything you need exactly when you need it. Our rooms come with a flat screen TV, wood-burning fireplace, complimentary Wi-Fi, and the highest quality linens and towels designed to make you feel right at home. Our restaurant menu specializes in traditional Mexican food featuring locally-sourced ingredients, and also features staples of international fare for every taste. Our fully-stocked bar is manned by fully trained bartenders happy to mix any of Mexico’s renowned drinks for you. As proud patrons of creativity, we feature original works made by local artists throughout the hotel. Below are some of our favorite amenities we’ve curated to give you an intimate and unforgettable experience. Available packages for weddings, retreats, receptions, conferences, birthday celebrations.